Donald Trump likes to remind America that he's a master dealmaker. "I'm going to make the greatest trade deals we've ever made in our country," he proclaims in his new radio ads. But experts say Trump is talking a lot of nonsense on trade. It isn't backed up by the data. 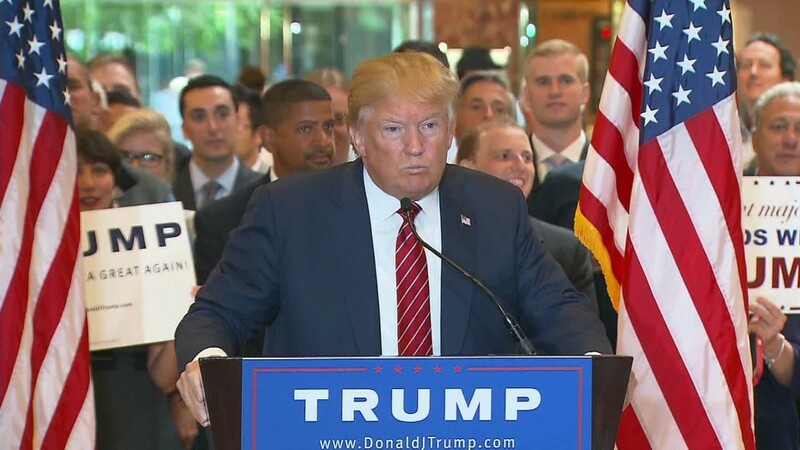 "[Trump] wants to convey as a presidential candidate that any deal that he was not involved with... is by definition an inferior deal because he didn't play a role," says Bernard Baumohl, chief economist at the Economic Outlook Group. Trump has railed against U.S. trade deals. He's gone as far as suggesting America should slap huge fees -- up to 35% -- on goods coming from Mexico and China. It's the kind of talk that would likely start a trade war that would likely hurt American jobs and exports, experts warn. In his new book "Cripple America," Trump is again arguing that America gets hurt by trade. 1. "We're losing all over the world with trade deals. Every country. No matter what country you talk about, you can just pick a name out of a hat, they're beating us in trade," he said during a press conference launching his new book. Reality check: The U.S. isn't the only major country to have a trade deficit -- France and the United Kingdom also do, for example. Furthermore, the U.S. has been growing its exports. 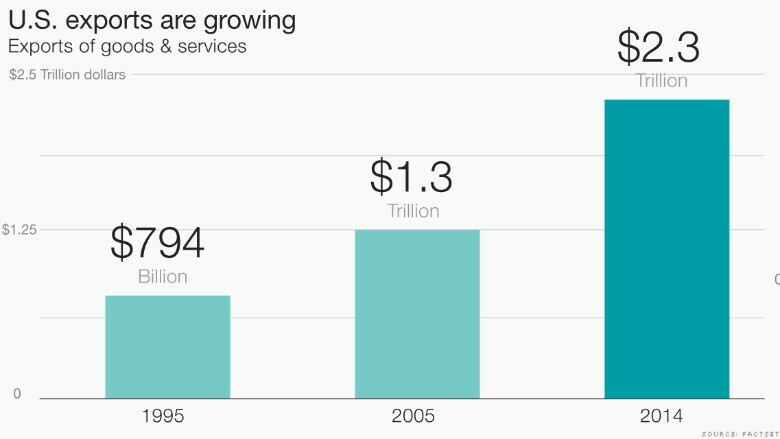 America now sells triple the goods and services abroad than it did in 1995. That has helped grow businesses and jobs at home. "American companies are very entrepreneurial and competitive. They are very good at adjusting to circumstances," says Adolfo Laurenti, chief international economist at Mesirow Financial. 2. "We sit there while we're getting beaten in trade agreements," he says in his new book. 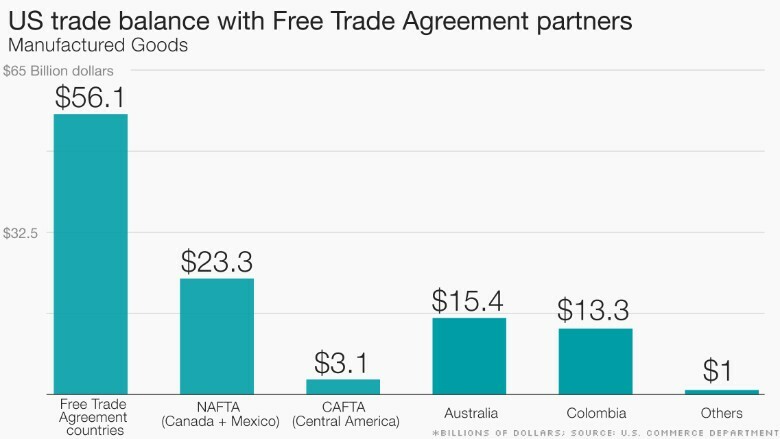 Reality check: The U.S. has done well with countries that it has Free Trade Agreements with -- nations such as Canada, Mexico, Colombia, Chile, Israel and Australia. While the U.S. still has an overall trade deficit with these countries, most of that is because America still imports a lot of energy. That isn't covered in trade deals. It's simply a matter of American needing more oil. Trade deals typically cover goods and services. America is one of the leaders in providing services. On top of that, the U.S. runs a trade surplus in manufactured goods with Free Trade Agreement countries. "These agreements are leveling the playing field for American firms," says Robert Lawrence, an expert on international trade at the Harvard Kennedy School. While it's always possible to say a deal could be better, U.S. exports of products such as cars and airplanes have been gaining in recent years with these deals in place. 3. "Our trade deficit has been a dangerous drag on our economy," Trump says in the new book. Reality check: The U.S. does run a trade deficit -- meaning America buys more from foreigners than it sells to them. But it has been that way since the 1970s. The U.S. has had many great years of prosperity and growth despite the trade imbalance. For all the focus on America's trade deficit, imports aren't a bad thing, economists say. The U.S. is getting a lot of cheap goods. That keep costs down for the poor and middle class. "A trade deficit is much more of an indication of our spending habits than our competitiveness," says Lawrence. Trump likes to say on the campaign trail that it's "impossible to go on like this any longer" on trade. But the U.S. economy is in a much stronger position than many of its global peers right now, and exports have held up better than expected despite all of the global headwinds. "Donald Trump's comments on trade really tend to consist of just platitudes," says Baumohl of the Economic Outlook Group.